There are many voice activated devices to help us in the home and at work, including Google Assistant, Alexa from Amazon, Siri from Apple and Cortana from Microsoft. Aleh wrote a post about Voice Search on SEJ and mentioned that it has really been in 2017 where there has been a surge in people using voice search. Strategy Analytics predicted that in Q4 2017 that smart speakers would reach 12 million units world wide and so 24 million for all of 2017. Google unveiled their voice controlled Assistant in May 2016 which is an upgrade of Google Now and they have built upon the “OK Google” voice controls but how much can these voice activated devices really help us? Some of us take our health for granted. One day I woke up and had blurry vision out of my good eye. I could not see my screen very well to read or do work, but luckily this was just temporary. However, RNIB states that in the UK, there are over 2 million people living with sight loss. This number is expected to rise to nearly 4 million by 2050. But what is being done in terms of voice search to help these people access the internet? I thought voice search would open up the world of the internet to more people who due to a disability or visual impairness could not use it. I thought older family members who have a hard time seeing clearly could use Voice Search. But who is using it? 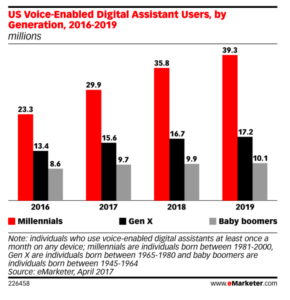 I don’t have the stats for the UK, but in the US, figures on TechCrunch from eMarketer.com show that the younger demographic, between 25 and 34 are using voice enabled digital assistants the most. They make up 26.3% of the users. In February last year, Amazon said that the sale of its Echo were up 9 times compared to the season before. However, these figures do not go into detail if these people are visually impaired or if they have hand mobility issues. According to the GlobalWebIndex, 43% of those age 16 – 34 who use voice search do so because it is quicker than going to a website or using an app. 38% say it is also easier than going to a site or website and 28% say it is a more accurate way of searching. It is interesting to note the last quote, that voice search is more accurate. People are using voice search for local search especially when people are on the go. It is therefore important to optimise for local listings if you have shop/restaurant/bricks and mortar business. Set up your Google My Business Listing. Optimising your site for local listings would help all customers find your business. It is used on simple searches, information and navigational, not yet transactional searches. Therefore it is competitive to rank for informational and navigational searches. However, I read in Search Engine Land that kayak announced in July last year that they allow users to book a room through Alexa. Users need to link their account with the credit card to make a booking, but it is the first step in using voice search to make transactions. I read a blog post by Damiano La Rocca, on Huffington Post about the accessibility of websites to visually impaired and disabled people. In 2010, the Equality Act was introduced to update the Disability Discrimination Act of 1995. However, there are still many websites who continue to break the law. 70% of websites reviewed by the Business Disability Forum found that their sites had a lack of accessibility. This means those who are visually impaired or handicapped cannot access your site. How would you react if you could not access a site due to poor website structure? Many visually impaired people use screen readers. It is therefore important to organise your content so that the main content is first or in the HTML, the user has a button they can click to skip to main content. I would also encourage those who do not have a mobile site to make sure they have one. This mobile site is important for all users especially those on the go (which most people are). Voice search will also positively impact the lives of those who have developed repetitive strain injuries. Carpal tunnel syndrome, RSI (repetitive strain injuries) and RMD (repetitive motion disorders) can be painful and prevent those from using the Mac/PC for long periods. If users could use voice search in their every day life more, they would still be able to feel included in the internet world without causing further damage to their injuries. Many people who have developed these RSIs may have had to rethink their career/job if it was predominantly computer-based. BUT these people don’t want to be excluded from the online world completely. Stephen at Branded3 wrote a great post about voice search and in it mentioned that by 2020, comScore thinks that 50% of all searches will be voice search. He also mentioned that Microsoft have 35% of the search market, while Google have 65% and there is potential that Bing will continue to increase its market share. For me, I hope that a company takes on voice search to help and include all people and those with disabilities. I was surprised to see so little information published about the use of voice search for those who are visually impaired or those with RSIs. Perhaps 2018 is the year where more stats will be published and more people who were excluded from the online world will be welcomed.